Earn 5% cash back at different places each quarter like gas stations, grocery stores, restaurants, Amazon.com, or wholesale clubs up to the quarterly maximum each time you activate. Plus, 1% cash back on all other purchases. Are you a die-hard hockey fan? You can show your allegiance to your favorite team by carrying the official card of the NHL® - the NHL® Discover it® CardNHL® Discover it® Card. Not only can you earn 5 percent cash back in rotating bonus categories that have included gas, restaurants, Amazon.com, Sam's Club and more, on up to the quarterly maximum each time you activate, but you can also earn 1 percent cash back on all other purchases. And what hockey-fan credit card would be complete without a discount? The NHL® Discover it® CardNHL® Discover it® Card offers 10 percent off all purchases made at Shop.nhl.com. Card holders also have the option to carry a card designed with the image and logo of their favorite NHL team. 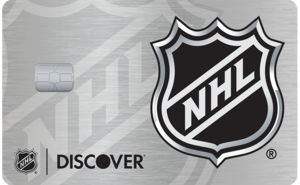 Currently, new NHL® Discover it® CardNHL® Discover it® Card members also earn a dollar-for-dollar match for all cash back earned at the end of the first year of card ownership, automatically. After the first 12 billing periods, Discover will match all cash back rewards earned and apply them to your account. That means if you earn $200 cash back in your first year, Discover will match that amount and bring your total cash back to $400. $0 fraud liability - you're never responsible for unauthorized purchases. Introductory APR is 0 percent for purchases and balance transfers for first 14 months. Late fees are waived if you are late with your first payment. Discover will MATCH all the cash back new cardholders earn in their first year, meaning $200 becomes $400. Cardholders can earn 5 percent cash back in rotating categories, grocery stores from April-June 2018, but also enjoy 1 percent cash back on all their other purchases. Earning 5 percent cash back is great, but you'll need to be organized enough to actually spend in those categories (and sign up each quarter). In general, this is a solid cash-back reward card if you're in the market for a rotating categories cash-back card. Sure, it takes a bit of planning and organization to maximize your rewards, but you stand to rake in some substantial cash back, especially in your first year, after which Discover matches all your cash back earned. The cash-back rewards themselves once earned never expire and can be redeemed for cash in any amount, at any time. NHL® Discover it® CardNHL® Discover it® Card members can earn 5 percent back on rotating categories each quarter (up to the quarterly maximum each time you activate, then 1 percent after that). Historically, categories have included everything from gas to eating out to purchases at home improvement stores to Amazon purchases. The NHL® Discover it® CardNHL® Discover it® Card also offers an introductory 0 percent APR on purchases and balance transfers for the first 14 months, so this is a good option if you're looking to make a few purchases or consolidate some high-interest credit card debt and pay it off interest-free. Cardholders can also freeze their account in seconds with an on/off switch available on either the mobile app or through Discover's website to prevent new purchases, cash advances or balance transfers should they temporarily misplace their card. Primary cardmembers can keep track of their credit score with free access to their FICO® Credit Score through Discover. But this is a hockey fan's credit card after all, so let's not forget that NHL® Discover it® CardNHL® Discover it® Card cardholders receive a 10 percent discount on their purchases at Shop.NHL.com. Lastly, unlike many niche credit cards, the NHL® Discover it® CardNHL® Discover it® Card is a member of the Discover it® family, so feel free to travel abroad with the card knowing that you won't be on the hook for foreign transaction fees. Those rotating rewards category every quarter are a great path to rack up cash back, but only if you use them. Discover isn't the only credit card company with rotating rewards, but it does make it challenging for the cardholder, especially if the categories one quarter aren't for you. Even if the categories DO align with your spending, you have to remember to activate each quarter or you won't earn the bonus cash back. In other words, if you'd prefer simplicity to maximum reward opportunities, you'd probably do better with a flat-rate or tiered cash-back credit card. The NHL® Discover it® Card has no annual fee compared to the Capital One® QuicksilverOne® Cash Rewards Credit Card which has a $39 annual fee. With both cards, your cash-back rewards never expire and you have $0 fraud liability on unauthorized purchases. Neither raises your APR if you make a late payment and neither comes with over-limit or foreign transaction fees. 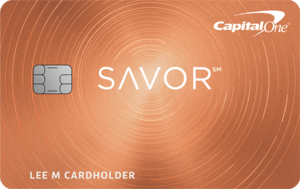 The Capital One® QuicksilverOne® Cash Rewards Credit Card is, however, a flat-rate credit card with which cardholders earn 1.5 percent cash back on every purchase, while NHL® Discover it® offers that 5 percent back on bonus categories and 1 percent cashback on all other purchases. If you're willing to keep up with the categories, and those categories fit your regular spending habits, you'll likely earn more with the NHL® Discover it® Card. 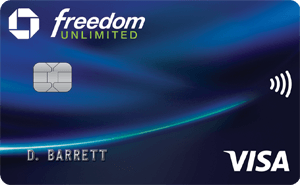 Neither of these cards has annual fee or over-limit fees and both include cash-back rewards that never expire and $0 fraud liability, but that's where the similarities end. The Bank of America® Cash Rewards credit card is a tiered cash-back credit card with a new offer: Maximize your cash back in the category of your choice: gas, online shopping, dining, travel, drug stores, or home improvement/furnishing. Now earn 3% cash back in your choice category and 2% at grocery stores and wholesale clubs (up to $2,500 in combined choice category/grocery store/wholesale club quarterly purchases), and unlimited 1% on all other purchases. You can update your choice category for future purchases once each calendar month using the mobile banking app or online banking, or do nothing and it stays the same. This card is a nice in-between for people who don't want the complexity of a rotating-categories card but do want more earning potential than a flat-rate card offers. (American Express is a CardRatings advertiser) The Blue Cash Everyday® Card from American Express, like the NHL® Discover it® Card, comes with no annual fee, rewards that never expire, $0 fraud liability and no over-limit fees, but the Blue Cash Everyday® Card from American Express is another tiered rewards option. Cardholders can earn higher rewards with the Blue Cash Everyday® Card from American Express -- offering 3 percent cash back at U.S. grocery stores (on up to $6,000 in purchases annually, then 1 percent), 2 percent cash back at U.S. gas stations and select U.S. department stores and 1 percent cash back for all other purchases. If grocery stores are where you find yourself often, this could be a great choice for you. See Rates and Fees. The Blue Cash Everyday® Card from American Express, however, does charge a foreign transaction fee of a 2.7 percent per transaction made while abroad. Although it's lower than the rates other cards charge, the NHL® Discover it® Card has no fees for foreign transactions, so it's a better choice for your travels outside the U.S. If you are looking for a card that allows you to earn cash-back rewards, pay no annual fee and offers some flexibility if you make a late payment, this is a great card for you, provided you are fine with rotating rewards options and have excellent credit. Oh, and have a particular passion for the puck.